As countries goes through a global recession and governments take action to get their economies growing again, most analysts say that will more than likely cause a bubble to burst, be it in Treasurys, gold, or commodities. The next economic bubble is on its way -- if it's not already here, analysts believe. The problem is, there's no clear consensus on what it will be or when it will hit. But there is a feeling that another crisis is about to burst. And as analysts debate over which bubble will break, they also differ on the impact it will have on the economy. "Bubbles are neither good nor bad," says Ed Greback, Chief Executive Officer for Tempus Advisors. "They are simply a normal market reaction to freely available funding or lack thereof." "We can't stop bubbles. It is human nature to keep creating boom and bust cycles," says Matthew Tuttle, financial author and money manager. "We have been going through this throughout history and will continue to do so." And if bubbles can't be stopped, they present opportunities for some. "A bubble is good when you can identify it," says Tuttle. "If you had identified the bubble in oil and commodities in early 2008 you could have made a lot of money. The key is to follow an approach that seeks to identify when a bubble might be forming." But if some see opportunities, others see pain. "To have a bubble is to have increased volatility," says Steve Wallman, CEO of Foliofn and a former SEC commissioner from 1994 to 1997. "If you get a return of 10 percent over ten years, that would be attractive. But in some time frame it will have a minus 40 percent return, then a 60 percent. That's pretty risky." And as for stopping or containing a bubble, Wallman says government can play a role in but seldom does. "It's leadership," says Wallman. "Government has to take on industries that say 'leave us alone.'" Treasury bonds: "The next bubble could be in Treasurys," says Timothy Canova, professor of International Economic Law at Chapman University in Orange, California. "Yields are near zero on short term and quite low on long term government securities," says Canova. "America remains dependent on huge inflows of foreign capital to finance debt ... if foreign capital inflows were to slow even a little, there could be a sudden drop in Treasuries and dollar-dominated assets." And Treasurys face a bleak future dues to stimulus plans according to John Grether, Academic Dean of Law and Economics at Northwood University in Michigan. "Government's around the world will roll over record short term debt this year and will flood the market with new issues to finance their stimulus plans," says Grether. "In that case, there will be more bonds out there than a skittish market will be willing to buy." Commercial Real Estate: "The next financial tsunami to hit will be the widespread failure of shopping center mortgages," says Peter Monroe, co-chair of REOMAC, a not for profit trade association. "Half a trillion dollars of commercial loans financed on historically low rates, are due for refinancing in the next three years," says Monroe. "The negative impact of these shopping center mortgages is enormous." Health Care Technology: "Continued spending on health care technology with a lack of improvement in care is driving an unsustainable cycle," says Dr. Winifred Hayes, president and CEO of Hays Inc, an independent health technology research and consulting firm. "The same dynamic and meltdown that hit the tech, real estate and finance industries is happening in health care." Student Loans/credit cards: "Two out of three college students graduate with debt and those who graduate from public schools owe $17,250 in student loans," says Scott Crawford, personal finance expert and CEO/Founder of DebtGoal.com. "Ten years ago it was only $8,000. Add the student credit card debt and this has the potential to collapse on itself." As countries goes through a global recession and governments take action to get their economies growing again, most analysts say that will more than likely cause a bubble to burst, be it in Treasurys, gold, or commodities. But the question about what or when doesn't begin to tell the story. 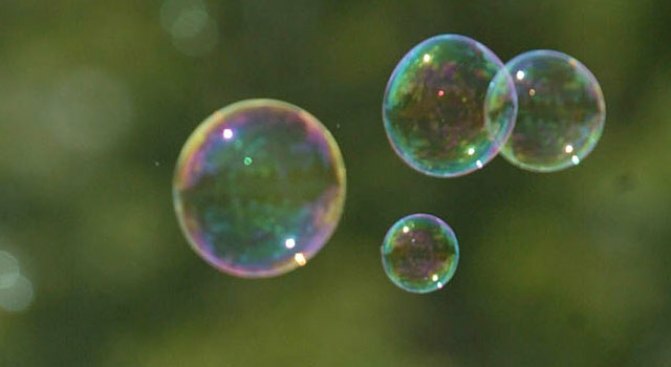 "The problem with bubbles is that they distort the allocation of resources," says DebtGoal.com's Crawford. "We had too many resources in housing contraction, consumer lending and retail. I think the lesson learned here is all these areas will still suffer for a while." "What a bubble does is allow you to reach a far extreme," says Wallman. "Something might blossom. It's sort of an evolutionary theory of the economy. But boy, what a cost."